What are these raised platforms in Roncesvalles and are they a benefit to cyclists? The CBC recently gave them a thumbs down with the consensus that they are frustrating and confusing. I ride them daily and live in neighourhood. So what’s the scoop? To consider some context, it would be worthy to note what existed before the platforms were built. Just prior to the devastating upheaval that had reduced Roncesvalles to a construction site, the narrow street featured motorists that would nip at the right lane and sling themselves past the streetcars in attempt to elude traffic. Meanwhile cyclists would brace themselves against this onslaught while riding on this heavily pebbled encrusted street. When the tectonic plate jack-hammering finally ceased and the platforms appeared, there were no markings of any kind. People waiting for the streetcar didn’t know what to make of this uncharted territory as they inched across the platform. It wasn’t until days later a sign appeared which I acknowledged as being divine intervention. In my jubilation, I declared these mysterious raised platforms as ‘launching pads.’ Forget Lance, I was Neil Armstrong, each time initiating a countdown in my head as I approached them. I began making a game of it, propelling myself faster and further each time, though stopped short of terrorizing pedestrians, cautious not to be branded an outlaw in my own neck of the woods. However friction between cyclists and pedestrians was inevitable. The one constant is the influx of people who wander out on the platform who are either unaware, distracted or feel perhaps even feel entitled to their spot and refuse to acknowledge a cyclist coming towards them. Initially, this was one of my biggest nuisances of riding anywhere in the city. The most glaring of incidents is what I call the convergence. This occurs when people migrate to the edge of the platform while anticipating an open door of a giant sardine of a streetcar sliding to a halt. 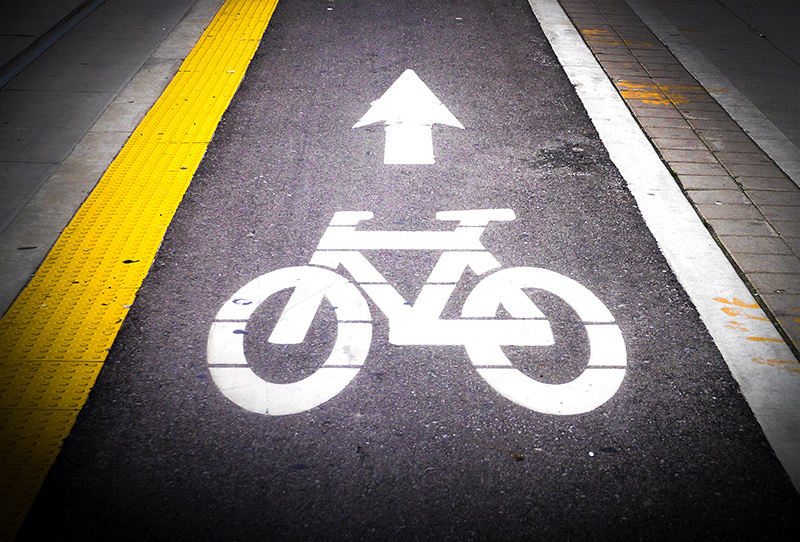 All the while cyclists are in cruise control mode without a hint of slowing down. In some cases it becomes a game of wits that have lead to heated exchanges, only to be amplified during rush hour. 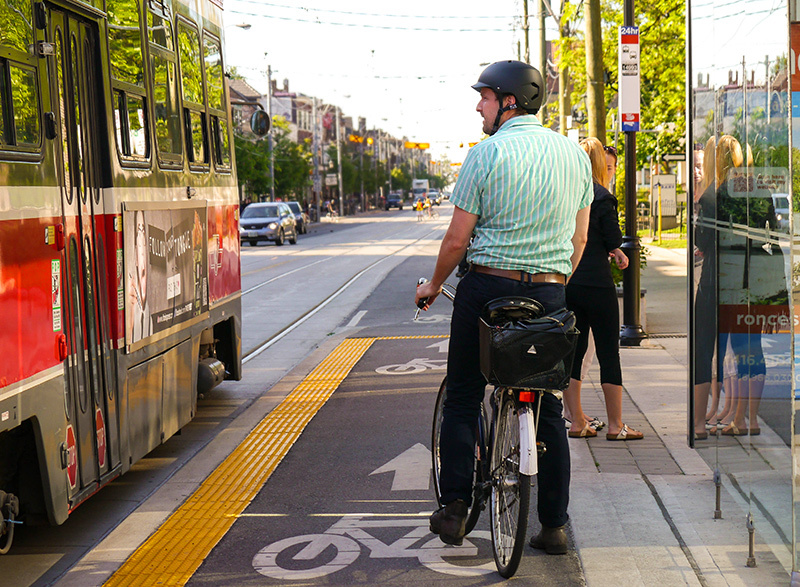 All of this can be avoided by following the rules of the road in which bicyclists must stop when the streetcar doors open while pedestrians keep an open lane-way when there is no streetcar in sight. Of course that was the intent and at present may seem like wishful thinking. So what is the solution? I would reckon that it’s just time. After all these bump outs are the first of its kind in the city and change is nothing new to this village. Roncesvalles embraced gentrification, with a renewal of foot traffic increasing ten fold that support new, thriving businesses. Yet it remains true to its core as an active community that is receptive to biking culture as any neighbourhood in the city. At first, it may not first appear to be perfect solution, but the community are slowly adapting to them. 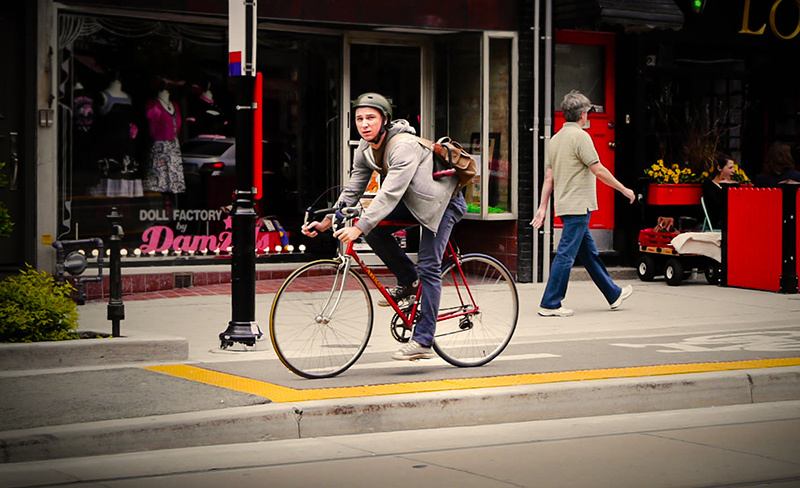 The majority of pedestrians do stand off to the side or politely move when they see a cyclist. While on some days it may not feel like a pleasure ride during commuting hours, it’s far better than what we had before. But not to be dismissed are the moments of carving through the hot summer night air, making this prime path one of the best urban biking experiences in the city.